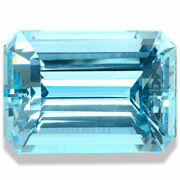 Aquamarine, the blue or turquoise variety of the mineral beryl, is one of the classic colored gemstones. Valued for its very good hardness and superb transparency, aquamarine evokes the colors of the sea and the sky like few other gems. Aquas can rangle in color from blue to green, but the pure blues are the more valuable. Green aquas are often heated to reduce the yellow, so a clean unheated blue aquamarine with good color saturation is a rare and valuable gem. All aquamarines are pastel in color, but some are so light as to be pallid. Darker-toned aquamarines usually command the highest prices in the market. But color saturation should not be confused with tone. Some of these darker toned aquas actually have quite a bit of gray and are not nearly as attractive as lighter toned gems in a purer blue. Because aquamarine is a lighter colored gem with excellent transparency, inclusions are highly visible and can spoil the beauty of the gem. So a high clarity grade is more important in aquamarine than in sapphire or ruby. 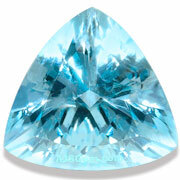 Most high quality aquamarines are graded "almost loupe clean" or "loupe clean." There are several approaches to cutting aquamarines, but in every case fine cutting is essential. One approach is to cut large facets that maximize color. So you will see many aquas with variations on the emerald cut. Others are cut with portuguese cuts to maximize brilliance and sparkle. 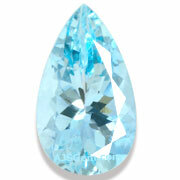 You'll find that aquamarines are often offered in larger sizes, with many specimens over 5 carats. The larger stones tend to have a richer color because of the longer light path. Though large aquamarines are not uncommon, top grade stones of good color are rare and fairly expensive in sizes over 10 carats. Still, the per carat prices for these large aquamarines are really quite attractive when compared to any other fine hard gemstone in larger sizes. Aquamarine is found in many locations in the world, but the the most famous producer is the state of Minas Gerais in Brazil. Recently some very fine aquas have been found in Madagascar as well. 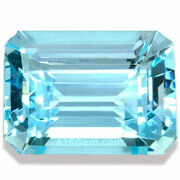 A gorgeous large aquamarine with very good color saturation and perfect clarity. Beautifully fashioned in a precision emerald cut, this fine gem will make an impressive ring or pendant. 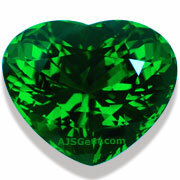 A splendid large chrome tourmaline in the classic deep emerald green color. Very clean and precision cut in a subtle heart shape. 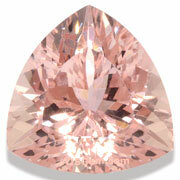 A very fine gem morganite in a big size (18 mm). The color is a lovely salmon pink. Superb clarity and precision cut with excellent luster and full fire. Guranteed natural and untreated. 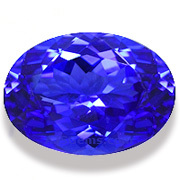 As fine a tanzanite color as you will see, this vivid violet blue rivals the finest sapphire. 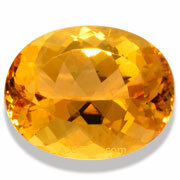 Superb clarity (graded "loupe clean") and an excellent portuguese cut maximize the brilliance of this fine gem. 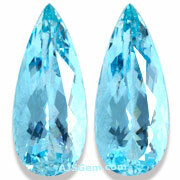 A stunning matched pair of very large aquamarines. Excellent color saturation and perfect clarity, suitable for the most discriminating collector. These gorgeous gems will make a dramatic and elegant set of earrings. Sotheby's will auction three important necklaces at their April 7th Magnificient Jewels and Jadeite sale, including 2 featuring important colored gemstones. The Red Emperor, designed by James W. Currens, includes 60 Burma rubies (104.51 cts total) with 59 carats of diamonds, with an estimated price of $8.7 to $11 million. The Hutton-Mdivani jadeite necklace was designed by Cartier in 1933 and features 27 graduated jadeite beads of exceptional size and translucency, with a consistent emerald-green color. The estimated price is above $12.8 million. A deal is not a deal until it's a done deal. Sotheby's rediscovered this maxim recently when they had to buy back a flawless pink diamond weighing almost 60 carats that it sold last November in Geneva. The buyer, New York diamond cutter Issac Wolf, defaulted on the record $83 million payment. Sotheby's was forced under its auction contract to buy back the diamond, and it is now listed in its inventory with a value of $72 million. Yes, you are welcome to place an order and give us your credit card information by phone or fax. We offer a range of payment methods to suit the convenience of our customers who don't wish to make large purchases online, including bank transfer, credit card and PayPal.